Join Winemaker, Corey Schuster, as we pair 4 courses of Chef Bill Wallender's seasonal & local cuisine with his wines. "I began my journey in the wine industry pouring for a small, family-owned winery near Salem, OR. My first career was all office work, so when I found myself working in a bucolic setting, the grin didn’t fade for days. When Fall hit I joined a harvest crew. Harvest work is hard, wet, with long-hours, but ultimately satisfying work. Camaraderie is formed through the suffering, and there is always something new to learn. The first team lunch I had began my love affair with the industry, and wine: a tired, wet, exhausted crew sharing a large meal and a glass, taking a break from the work to regroup and prepare for the afternoon’s tasks. This showed me: the wine industry is about community, and a love of the work, something I’d not experienced before. For me, the chance to create something, to have an end product I could hold in my hand and share led me to wanting to make my own wine. Further, wine is a social beverage. A wine bottle contains memories, experiences, and love. I want to create this." 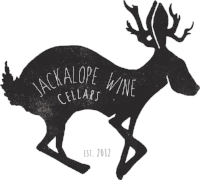 Jackalope's wines will be matched with multiple courses from our seasonal menu in a private, family style, event in our upstairs dining room. The Winemaker will be present to discuss their wines and will be dining with our guests.